I am an ancient historian specializing in the social, intellectual, and political dimensions of late antiquity with a keen interest in the interaction between early Christian theology and Roman law. I have benefited from studying Latin, Greek, and Syriac sources for later Roman history alongside the epigraphic, paleographic, and archaeological remains of the early Byzantine Empire. My current inquiry seeks to explore how legal and theological changes were implemented on a socio-political level, both in the urban centers of clerical courts and also in the monastic cells lying on the fringes of late antiquity. I am also interested in the development and transmission of classical education in ancient Greece and Rome, including the practical dimensions of classical pedagogy in the ancient classroom. Over the last four years I have enjoyed teaching courses on a wide range of topics to undergraduate, high school, and middle school students. 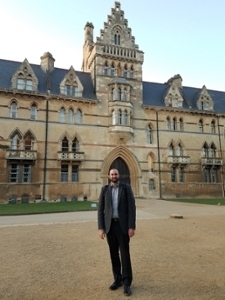 While at Oxford I designed and taught an upper-division course with Pepperdine University's London program while also studying as a Scholar-in-Residence at The Kilns - the former home of C.S. Lewis. I spent the following year in a classical public school teaching European history to high school students in a Socratic, seminar-style approach. I also had a fantastic time teaching Latin to fifth, sixth, and seventh graders during that academic year and in subsequent summers. I then benefitted from working as a teaching assistant for Dr. Judith Evans-Grubbs, leading discussions and two lectures in her course, "Emperors, Monks, and Barbarians." I enjoyed teaching "Western Heritage" on Pepperdine University's Malibu campus the following summer, and in the spring I will design and teach a new undergraduate course, which is cross-listed with the History and Religion Departments of Emory University.